Iron Man 2 is a 2010 American superhero film featuring the Marvel Comics character Iron Man, produced by Marvel Studios and distributed by Paramount Pictures. It is the sequel to 2008's Iron Man, the second film in a planned trilogy and is a part of the Marvel Cinematic Universe. 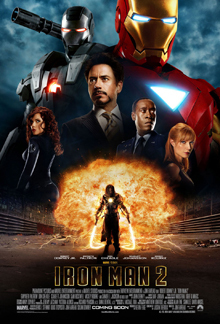 Directed by Jon Favreau, the film stars Robert Downey Jr., who reprises his role as Tony Stark. Stark has revealed his identity as Iron Man and is resisting calls by the United States government to hand over the technology. Ivan Vanko has duplicated the technology and built weapons of his own, creating new challenges for Stark.